Women’s basketball alum Jaslyen Singh spearheaded the launch of Books and Basketball, an after-school program at Howe Middle School. An important part of the UFV athletic department’s mission is to cultivate the growth of our student-athletes into well-rounded citizens who give back to their communities. To that end, the Cascades seek to connect with and serve our Fraser Valley communities through a variety of initiatives. Here are a few of the specific ways we’ve endeavored to reach out. 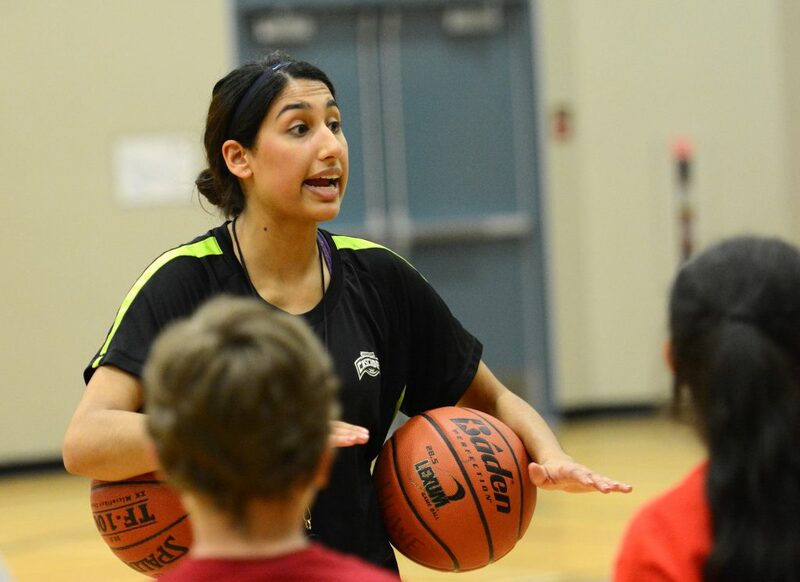 • In 2014, UFV women’s basketball alum Jaslyen Singh spearheaded the launch of Books and Basketball, an after-school program at Colleen and Gordie Howe Middle School. Students in the program participate in basketball skills sessions led by UFV student-athletes, and spend additional supervised time doing homework or reading. • Since 2014, the Cascades men’s soccer team has taken part in the Gutsy Walk for Crohn’s and Colitis in support of teammate James Najman. Najman was diagnosed with Crohn’s disease at age 11 and overcame long odds to play university soccer. He has been active in raising funds to help find a cure for inflammatory bowel diseases, and in 2014, he served as honourary chair of the Abbotsford Gutsy Walk. His Cascades teammates, along with members of the women’s soccer program, participate in event set-up and take-down in addition to participating in the walk. The Cascades women’s soccer team made and served a meal at Ruth and Naomi’s Mission in December 2015. • The Walk and Knock food drive, originally established by women’s basketball alum Alexa McCarthy, has become an annual Halloween tradition for the Cascades. Each year, UFV student-athletes go door-to-door in Abbotsford, soliciting donations of non-perishable food items for the Abbotsford Food Bank. In 2015, the Cascades extended the project for the entire month of October, collecting food at home games in an initiative billed as Cascades vs. Hunger. All told, student-athletes were able to collect 935 pounds of food for the Abbotsford Food Bank. • In December 2015, the UFV women’s soccer team decided to forgo their traditional Christmas party in favour of spending an evening at Ruth & Naomi’s Mission in Chilliwack, preparing a meal for people in need. In the spirit of the season, the team handled every aspect – from buying the groceries, to preparing the meal, to serving the food, to cleaning up afterward. In the end, about 120 people enjoyed lasagna, Caesar salad and garlic bread courtesy of the Cascades. • The Cascades women’s basketball team’s CIS Shoot for the Cure fundraisers have become one of the UFV athletic department’s signature community events. Each year, the squad hosts a pub night fundraiser on a Thursday evening, followed by a Shoot for the Cure game night on Friday. Over the last five years, the Cascades have raised roughly $18,500 for the B.C./Yukon chapter of the Canadian Breast Cancer Foundation, including $4,600 in 2016. The Cascades have also been involved in fundraising and/or volunteering for initiatives and organizations like Movember, Big Brothers Big Sisters and Operation Red Nose, among others. To pitch a community project to the Cascades, contact Alicia Hurley (alicia.hurley@ufv.ca).